We got a Canon MF6180dw multifunctional printer at the office. It is connected to the network through a LAN cable. Everything is working properly, but we don't want to change the printing options every time we need to print something (The printer has 3 source it can print from, 2 drawers and 1 multi-purpose tray). We would need 3 fixed configuration for printing, one for simple A4 printing (drawer 2), one for printing letters (drawer 1) and the multi-purpose would print a specific size we need. First, I though we would set up a same printer driver (UFRII LT) three times, with different settings, but I would need to add and configure these printers on every computer that is on the network and even than, the users can misconfigure them. How can I setup a single printer's configuration "shortcuts" so I won't need to make changes on every computer? 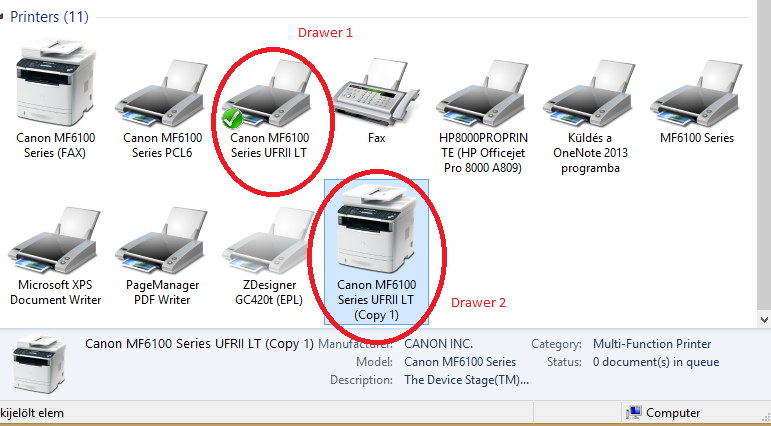 The image below shows what I tried to setup, a copy would print from another drawer. If the users connect directly to the printer, then yes, you need to install all 3 of them on every PC. However, if you install the drivers on a server, your problems go away. Install the printer on the server 3 times, and set the defaults for each copy from Printer Properties > Advanced tab > Printing Defaults. Then the users can install those drivers by connecting to the server. To make it even easier for them, the printers can be installed via a login script or GPO. Not the answer you're looking for? Browse other questions tagged printing printer network-printer or ask your own question. Why can't print to a network printer? Slow printing in company network, no network problems, what else could it be?